As more and more is being discovered about the beginnings of Christianity, a whole new understanding of the context of Christian origins is emerging. Any serious student now needs a knowledge of the traditions of the temple. This book, a supplement to Margaret Barker's The Gate of Heaven: The History and Symbolism of the Temple in Jerusalem, breaks further new ground, showing how the symbols and rituals of the temple shaped the lives of the early Christians, and illustrates the striking relevance of temple theology to the New Testament. The influence of the temple cult has to be reconstructed by drawing on the increasing number of non-biblical texts now available. These include those written in the early churches; fragments from among the Dead Sea Scrolls; and Jewish texts written in the early Christian period. Piece by piece the world of the temple is emerging from this material. Through this close study of the Pseudepigrapha and other non-canonical writings, Margaret Barker examines four symbols of temple theology: Light, Life, Blood, and the Robes of Glory. She shows how details missing from the Old Testament descriptions can be recovered from other ancient texts to throw new light upon many significant passages of the Bible. This is a reprint of the volume published by T. & T. Clark in 1995. On Earth as it is in Heaven by Margaret Barker was published by Sheffield Phoenix Press in June 2009 and is our 49968th best seller. 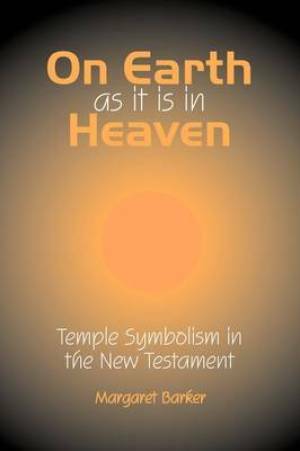 The ISBN for On Earth as it is in Heaven is 9781906055752. Be the first to review On Earth as it is in Heaven!